I had a passion for cricket from an early age and whilst growing up in Azam Square in Karachi, I used to play street cricket with a tape-ball. In 2008, I started to play hard-ball cricket when I joined a local academy where I stayed for 2 years. After that, in 2010, I joined The Rashid Latif Academy and started to play Club cricket. In another 2 years’ time in 2014, my association with this academy allowed me to join the KCCA Zone 3 team where I was coached by Azam Khan. For 2 years, I tried to find a place in local Under-16 teams but could not succeed. I had no option after that but to appear for trials for the Under-19 level and I was thankfully selected to play Under-19 for KCCA Zone 6 team. 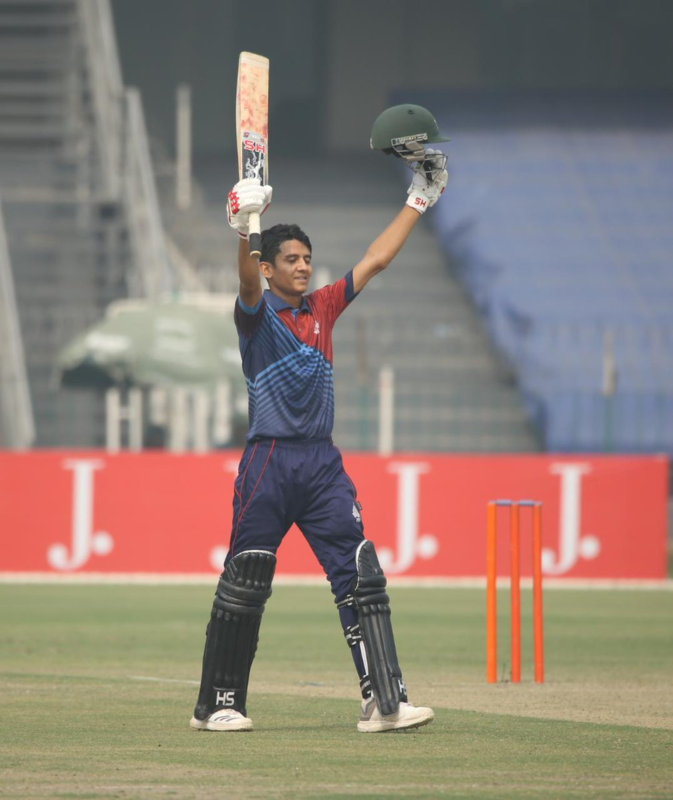 Playing for them in the Inter-District Under 19 Tournament 2014, I made 434 runs in 6 games, and also contributed with the ball, taking four wickets; this eventually lead to my selection for Pakistan Under-19s. This was an amazing experience for me as I ended up with 293 runs as the 4th top run scorer in the tournament and was also the highest run scorer for Pakistan. In the six matches I played, I scored 117 in our game against Nepal and 86 against Sri Lanka and ended up with a batting average of 98 by the time we bowed out of the tournament. I also managed to pick up 11 wickets during this time to make this a very satisfying experience. However, one of the most memorable parts of the tournament for me was in the match against Sri Lanka when I came in at the fall of the 4th wicket and helped the team to 212 runs with 86 runs, and then took 2 wickets as well. For my effort I was awarded the Man of the Match award. The Under-19 World Cup was a great experience for me as it also gave me exposure to the world of top-class cricket. I had started off as a leg-spinner until 2015 but switched over to bowling fast at the beginning of 2015 at the insistence of my regional Under-19 coach. By the time the Under-19 World Cup came along, I was well on my way to be classified as a batting all-rounder and my bowling proved the point during this tournament. On my return from the Under-19 World Cup, I was selected for the Pakistan Cup in 2016 for the Sindh team which was being captained by Sarfaraz Ahmed. Unfortunately, I did not get a chance to play in any of the matches but being in the presence of some top-quality players was also a good learning experience. I also got to experience the somewhat aggressive style of captaincy of Sarfaraz Ahmed and he did give me some good advice whenever I got a chance to speak to him. I then moved to Grade II cricket where I represented PTV for 2 years at that level until the time the side was promoted to the First-Class level. This happened after we won the Grade II final in 2017. In the semi-final, I took 5 wickets and was Man of the Match whilst I had a good performance in the Final as well, scoring 36 runs and taking one wicket (dismissing Haris Sohail). After PTV’s promotion to First-Class level, I made my debut at that level against Karachi Whites in the Quaid-e-Azam Trophy in October 2017 where I took 5 wickets. When the season ended, I had taken 14 wickets and scored a total of 161 runs in 5 matches which really gave me a lot of confidence for the future. The move to First-Class cricket was an eye-opener for me. Although, I have always preferred the shorter formats of the game, playing in the four-day game taught me important lessons about one’s temperament and also gave me experience of playing against some top-quality international players as well. The shorter formats of the game interest me a lot as I find them much more interesting and fast-paced which seems to be the way cricket is going today. If you look at how Fakhar Zaman played in his debut Test where he played his natural aggressive game, its clear to me that only by playing well in the shorter-formats of the game can you also succeed in Tests as well. This is how I also play in four-day games and hopefully this will get me success in this format as well. I feel that this tournament went really well for me as I scored 218 runs in 6 innings with 103 not out as my highest score of the tournament. I also took 5 wickets in 9 matches, but the highlight of the tournament was the fact that I was asked to captain the PTV team due to the absence of Saud Shakeel who had been called up for Pakistan A duties in the UAE. I was asked by the team management to take on the responsibility of captaincy which was a great honour for me. To be honest, the burden of captaincy at such a young age did not weigh on my shoulders that much as when I am batting, all I think is about my own batting and in fact I played better cricket when I became captain. I had some senior players playing under me in the team such as Abdul Razzaq and they were all very cooperative and supportive of me and gave me advice when I needed it which made the whole experience very enjoyable. I really wish to be recognised as a capable all-rounder as in the past few years, I have put in some good bowling and batting performances. My aim is to play like a proper batsman when batting and to bowl like an accomplished bowler when its time to bowl. This obviously needs a lot of hard-work and preparation as you are now preparing both aspects of the game in equal measure. In terms of my bowling, I would like to improve upon my pace which is around the 130Kph mark. Ideally, I would like to take this speed to 140KpH and also add more variation to my bowling as well so that I am able to bowl better quality bouncers and slower deliveries as well. When I bat, I usually play at the number 4 position with the intention of playing to the end of the innings. But there have been situations based upon the requirements of the team that I have come to bat at the number 6 position as well. Regardless of the position I bat at, my intention is always to bat well and take my team to a winning position. I am very fortunate that the player who has been my idol, Abdul Razzaq, also happens to be in the same team that I have been playing for. He was always my role model and I used to watch him on TV but never thought that one day, I would be playing alongside him. I am sure if I had said this when I was younger, people would have laughed at me for even imagining this. Not only are we in the same side, we even batted together which was really incredible and a great learning experience for me as I got to see one of the top all-rounders of the world batting alongside me in a match. I was selected twice for the Karachi Kings squad in the Pakistan Super League but did not play any games although I did travel with the team to the UAE and also played some practice games as well. In the next season of the PSL, if picked by any franchise, I would love to perform with the bat and/or ball and then get noticed by the national selectors, and hopefully find a place in the Pakistan team.